I started my career at Vogue Magazine in New York and then joined Glamour magazine as their travel editor. In this capacity I went on a trip with David Bailey, the quintessential 60's photographer, to Japan, the Ivory Coast, Spain, Portugal and Paris. While in Japan David took me to a Nikkon factory where I bought a camera and two lenses. Every evening he gave me lessons and I was hooked. As well as the words to describe these countries I had a visual journey to accompany my story. When I returned to New York I showed my work to Alexander Lieberman, the Art Director for Conde Nast and Miki Denhof, the art director of Glamour magazine. They liked what they saw and told me from now on they would not send me out with a photographer. This book is a partial visual diary of my life since becoming a photographer in the middle 60's. (The 90's is the only decade not represented. Principally, during that era, I concentrated on working with nudes and anatomy). 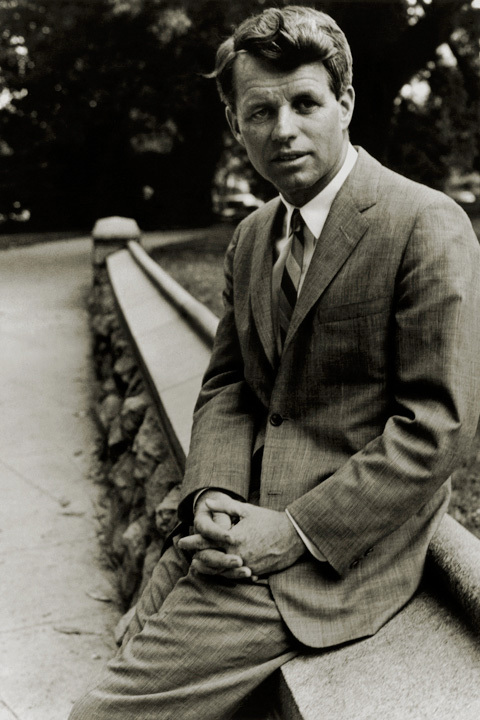 My first assignment was to photograph Bobby and Teddy Kennedy. The story was to illustrate the point that the young were more interested in politics than ever before because of the men in politics. I spent two days with Bobby. He was so kind, polite and helpful in every way to a young photographer. I worked with him in his Senate office, and then he suggested that we should take a walk outside and that is where the image in this book was taken. At one point he said to me: " I understand you photographed my brother, Teddy, last week. I said: Yes. He said: "Did you like him"? Yes, I replied. "But did you like him more than you like me?" At the end of the second day he ordered a car to take me to the airport and we were standing on the steps of the Senate when a dog ran out into the middle of the road. Bobby followed him holding up his hands to stop the traffic and escorted the dog across the road to safety. I learned a lesson that day to never pack my cameras away. By doing so I missed a wonderful series of shots. My job as a travel editor gave me the opportunity to fly to every part of the world. A friend of mine was Peggy Hitchcock, whose brother, Billy, had a beautiful estate in Millbrook. After Timothy Leary and Richard Alpert were forced to leave Harvard and then Mexico they were given a house in Millbrook. I had never taken drugs in my life but I asked my angel of an editor-in-chief, Cathleen Casey, if I could take the ultimate trip - going on a new type of journey by taking LSD. She thought it was a great idea and I prepared for the experience by going to Millbrook for a few weekends in advance. Timothy Leary was my director on the trip. 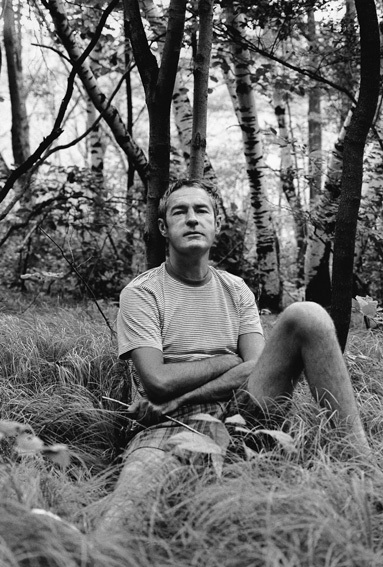 For the first moments I told Leary that nothing was happening but then I looked at my arms and legs and jewels were dancing out of every pore. The experience was so positive for me. A beautiful room in the house had been prepared for the occasion - a fire was glowing, Vivaldi's music was playing and there were flowers everywhere. The next phase was my being part of all of the above - the energy of the flowers, music and fire were flowing through me and even inanimate objects like the table and the furniture also shared this life. The session lasted over fourteen hours and I went through so many different stages. In one of those I had layer after layer of my persona removed until I became like a Giacometti sculpture stripped to the core. Another part of the trip was being a cell washed up on a wave and then passing through many different evolutionary phases - for a while I was stuck in the reptilian era but I and all around me radiated beauty except for Timothy Leary. If I looked at him he was always deformed. This phase continued until I felt being conceived, being an embryo and then reborn. It was one of the most profound experiences of my life. I was fortunate but I have heard of others suffering horrendous experiences so I am not recommending LSD. A couple of years ago when I was being exhibited at Art Basel, Switzerland by my Gallery - Gmurzynska -- I met Albert Hofmann, the scientist who discovered the drug. I spent three fascinating hours at his home, near the French border, talking and photographing him. There is so much more to tell abut this encounter. He told me that while he was the founder of LSD, Leary was the disobedient son. The image in the book of Timothy Leary was among those taken in the 60's but the most important one of all resulted from the assignment I was given by Glamour to fly to Europe to photograph Racquel Welch in Spain (the image is in the book), Albert Finney in London (also in the book) and the new hot young actor who had just come out in his first two movies - Michael York. This was a fateful meeting as Michael is now my husband of forty years. Our attraction was immediate and a romantic and fate filled year followed until our marriage a year later. We met in the spring and that fall went to India where Michael played a rock star in the James Ivory (also in the book) Ismael Merchant film "The Guru". In that most exotic of countries. Michael proposed to me on Juhu Beach. A couple of weeks later I was dying. I had never been sick in my life and was given by a London specialist pills to prevent becoming sick in India. I discovered I had a fatal allergy to sulfur. I survived and that is another story but the devotion and love of Michael and care and support of Indian doctors and friends will always be with me. This turned out to be a positive experience as I discovered homeopathic remedies and have shunned allopathic medicine as often as possible although I believe the two modalities should work in synergy and that there are heroes in both fields. Moving on to the 70's. 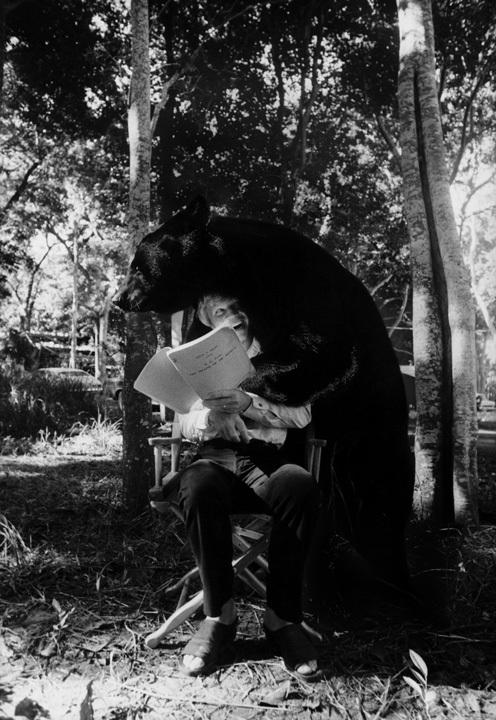 In this decade I have chosen to describe a photograph of Michael and his bear co-star hugging him and it seems the animal is giving him advice about his screenplay. This was taken in St. Croix on the set of "The Island of Dr. Moreau". The two of them would swim during the lunch hour with the huge creature always on a leash. One afternoon I was walking by and suddenly saw his co-star run over without his leash and hug Michael. Some people are convinced this is a trickery Adobe Photoshop, but It is not. 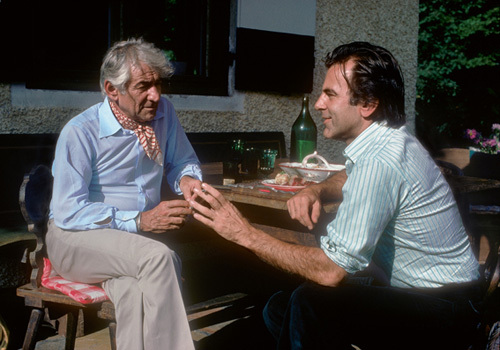 Another 70's photograph of Leonard Bernstein and Maximillian Schell was taken in Austria at the Salzburg music festival. We knew Leonard and l loved his brilliance and ebullient affection. I miss him both as a friend and musician. Also in that decade I photographed Yusuf (Cat Stevens). He was gentle and so accommodating. I wonder if, as a Muslim, he has given up smoking. Two more out of many photographs of the 70's are Jack Nicholson and Tennessee Williams. The photograph of Jack was taken as he was leaving this idyllic cliff-hanging property situated in the village of La-Garde-Freinet in the South of France owned by the director, Tony Richardson. We had been invited for a couple of days to join the other guests - Buck Henry, Angelica Huston, David Hockney (also in the book) and John Gielgud. It was a fascinating group of people who interacted on different levels. I caught Jack as he was walking up the steps to his car. The peacock on the roof personified the otherworldly quality of time and place. Jack, the most contemporary of men, was as at home here at this escapist's paradise as in the grittiest of his film milieus. The photograph of Tennessee was taken on the way to Washington, DC. He is hugging his play, Outcry, which was in a constant state of revision, sitting on his suitcase with his typewriter by his side. We were all waiting for the reviews on the night it opened at the Kennedy Center on the way to Broadway. When the papers arrived with a rave review from Richard Coe, Tennessee burst into tears saying: "This gives me the courage to continue writing'". Every night Tennessee and I had dinner alone as Michael did not want to eat before a performance. One night before the Opening on Broadway, he clinked his sake glass against mine, saying: "Pat, while there's doubt, there's hope". This image of John Cage was taken in the 1980's in New York in his home and studio that he shared with Merce Cunningham. He told me that the traffic outside sounded like his music. He was so hospitable and cooked me a macrobiotic lunch - later he sent me macrobiotic recipes - he was convinced when he died he would be in the healthiest state of his life. We laughed a great deal, talked about his music and shared stories of our lives and generally had a great deal of fun. At the time I was photographing him he was preparing a new piece for a festival in Switzerland called 'Fourteen'. He told me, among many other anecdotes his advice for young musicians: look over the whole history of music and find out which part interests you the most and then pay attention to it in detail. I have been working on the Art World series for the last few years and some of the artists I have photographed are in this book. I began working professionally when Pop Art was flourishing and there was a creative frenzy in the air. 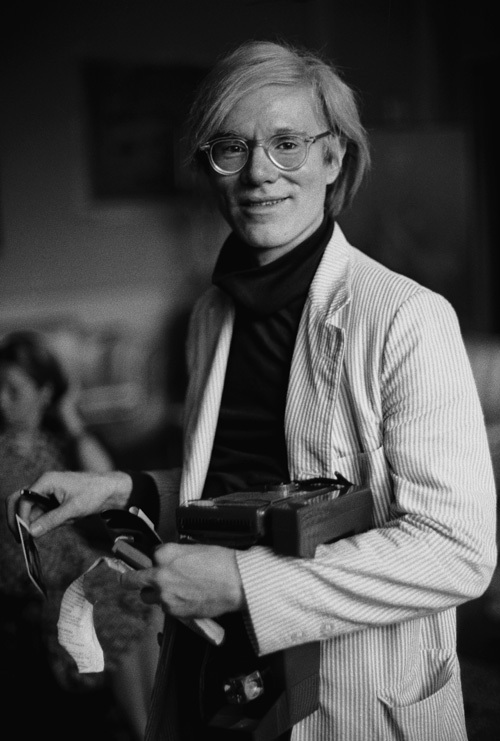 Andy Warhol became a friend and I photographed him on many different occasions. The cover of my book is Andy holding his polaroid camera taken at the Volpi Palace in Venice. Since that long ago decade I have been able in the last few years to portray other artists in their studios and homes. More recently things came full circle when my subject was the ebullient and brilliant James Rosenquist -- one of the founders of the Pop Art Movement. We flew to Tampa and James picked us up and drove us to his home and studios. We stayed in his guest-house for two eventful and enjoyable days and nights. Later still I visited Jasper Johns in his Sharon, Connecticut, studio. He was in the forefront of so many artistic movements -- pop, minimal and conceptual. He has always been a true hero of mine -- meeting and photographing him was a huge privilege. I left him with regret wanting so much to spend more time with him. He was very generous with his expressive reactions before the camera and his hospitality. He has beautiful manners and is wonderful looking. After the session was over he invited me to tea and I had the opportunity to view part of his splendid private collection. I was a houseguest of Robert Rauschenberg in his idyllic compound in Captiva, Florida. This was nine months before his death. I had met him initially at his brilliant Combines exhibition at LACMA and then at a dinner hosted by Sam Keller at Art Basel, Miami. He also was a generous host -- dinner was a caviar pizza and conversation until 2 am. Although he had suffered a stroke his mind was sharp and full of humor. He insisted on standing up for me when I photographed him the following morning in his studio. Here are the names of just a few of the subjects in Fame and Frame, not mentioned above and photographed at the end of the 90's and the first few years of this new century and some, even earlier -- Kiki Smith, Damien Hirst, Tracey Emin, John Baldessari, Jeff Koons, Ed Ruscha, Mark Bradford, Lawrence Weiner and many others as well as a few collectors such as the great philanthropists Edye and Eli Broad and the art dealer, Leo Castelli. Also there are photographs of subjects in the movie, theater and music worlds -- Tom Stoppard, Federico Fellini, Franco Zeffirelli, Steve Martin, Whoopi Goldberg, Anouk Aimee, Liza Minnelli, Albert Finney, Jane Fonda and more. There are so many anecdotes I could relate to all the above artists, actors, musicians, directors and collectors but, as a beginner, I'm not sure how much you can put in a blog. The promotion of the book continues --two weeks ago the UCR/California Museum of Photography in Riverside opened an exhibition of Andy Warhol's polaroids with a couple of my images of Andy holding his polaroid camera and there I had a signing where I am delighted to say all the books were sold within an hour. On the 26th of May I am giving a lecture and book signing at the Corcoran Gallery and Museum in Washington DC, followed by a reception. On the 7th of June the same type of event will take place at the Huntington Library and Museum in San Marino, California. In the middle of March I go to Bath in England, where Michael is filming for 7 or 8 weeks. I am already setting up appointments to publicize the book in London. France is only an hour away and I would also like to do signings in Paris as the book features several icons of French cultural life. NOW I REALLY MUST STOP.